In summary 80% of this exam is around the topics related to infrastructure, networking, security and storage. There are 28 different courses authored by multiple authors. The total content length is more than 60 hours if you wish to cover each and every course. Most of the courses are short and to the point like 1 to 3 hours of length. There are few which are quite lengthy running more than 5 hours. One of the difficulties I found with Pluralsight courses is that there is no predefined structure. You can take them up in any order. It is difficult to understand which course should be taken up first and which ones later. Personally, I always find it easier to refer to multiple resources. I got to know from a couple of other folks who were also preparing for the same exam that Udemy has courses material. A few months back I had subscribed to the 70-353 exam course. 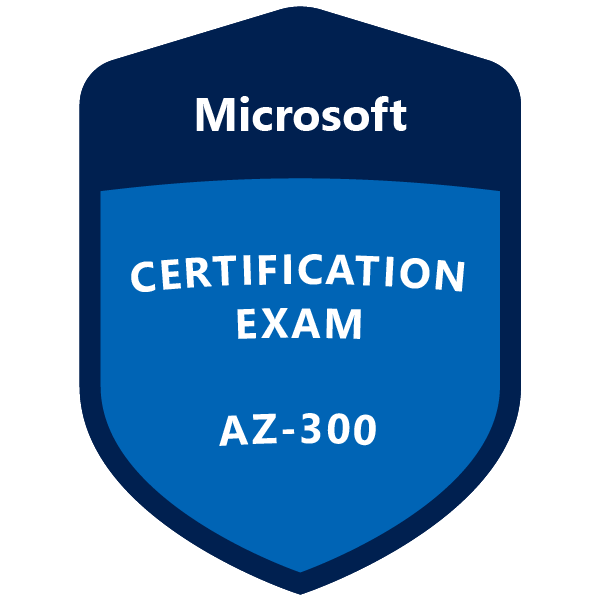 Since Microsoft replaced the older exam with AZ-300, the author Scott Duffy had restructured his course to cater to the needs of the new exam. I found the course structure to be very well laid out and it helped me quite a lot. The content may not be very deep in this course but it covers all the basics required to get through the exam. There are also a lot of references provided for additional learning. Not many people are aware that Microsoft Learning offers free educational content. This is provided on a different axis like based on role or based on technology or product. I selected the Solution Architect role based learning. The content is very specific to the point. I like the part where you can perform Hands-on Labs without having an Azure subscription. You are given temporary Azure account based on the duration of the topic and you can familiarize yourself with the capabilities of Azure. This is not just limited to the portal, there are cases when predefined VMs are also created with required tools in order to complete the required tasks. Microsoft learning also has a bit of gamification. Every course you complete, you get some points in the form of experience. Although the points cannot be redeemed its a good incentive to collect more points and indirectly it shows how many features related to Azure you have covered via Microsoft learning resources. Although the online courses are helpful, I am one of those people who does not feel comfortable unless I try it out myself. In most cases, I used my Azure subscription to get familiar with the concepts. In some cases, it is not possible to do so. Like in case of migrating an on premise VM to cloud. In such cases, I had to rely on the online course. Thing related to Storage accounts, Virtual Networks, VMs, app services, containers is all easily doable using the Azure subscription. I would highly recommend practising using your own subscription as much as possible. There are multiple reasons for this. First one is that many of the online courses are recorded more than 6 months before. Some of the features discussed in the module may not be available in the current Azure portal. Secondly, there are two sections in the exam where you will be required to perform tasks by accessing live Azure portal. If you have never tried it yourself, I can bet that you will not be able to perform these live tasks during the actual exam. I think there is an option provided by some test providers to retake the test once in case you do not clear it in the first attempt. In my case, I had used my MVP benefits to get some discount on the online test. There was no such option for me. Which meant that if I did not clear the test in the first attempt, I had to repay the full amount again. 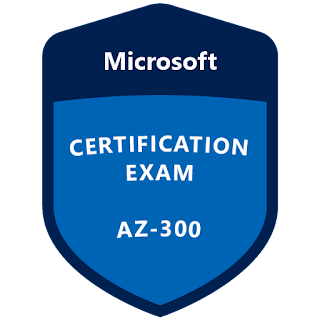 Luckily I found a sample test on Udemy by Scott Duffy and Riaan Lowe named AZ-300 Azure Architecture Technologies Practice Test. It has 2 tests with 50 questions each. Although the format does not match the actual exam, it still gives you an idea of what kind of questions to expect. It was also helpful for me to focus on areas which I was not very comfortable. One point to note is that this exam does not contain the live lab feature and is only restricted to the multiple choice type question. I had never taken any online certification test before. So this sample test really helped me a lot. If you have already taken other online certifications, maybe you will have a different experience. This is was the first time I was taking any certification exam. In the past, I have never been a fan of certifications. I am thankful to Puneet Ghanshani for changing my perception of certifications. On multiple occasions, I found my discussions with Mayur Tendulkar very helpful. He was the one who suggested that I try Udemy along with other resources. The certification exam looks at the breadth of the resources around Azure. I was able to complete the exam well before the stipulated time of 3 hours. If I were to go back and prepare for this exam again, I would follow a slightly different path. I would start with Udemy course and use Microsoft Learning in parallel with that. Then I would go through the Pluralsight courses and do the hands-on labs for deep dive kind of sessions. During the exam, there are different scenario based questions. At first, I found it a bit difficult to understand the structure of the test. You are given a case study and then there are supporting documents like existing infrastructure, technical requirements and target scenario. The multiple choice questions are then related to these sections. The different sections are separated into a multi-tabbed interface. If you do not go through each of the tabs, the multiple choice questions do not make sense. It took me some time to understand this pattern, but once it was understood the rest of the exam went well. I feel relieved that the monkey is off the back. It is a good starting point and I hope to continue with few more certifications. I hope that the people who are looking to clear this exam find it useful. Thanks Nilesh, that you shared your certification journey with us.